The anti-violence field has long known the impacts economic security has on survivors’ needs and access to support following violence, and new innovations are bringing attention to how economic security can prevent violence before it occurs, and not just on an individual level. 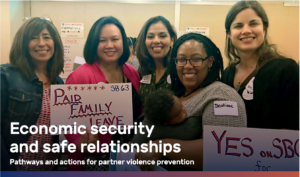 Prevention Institute‘s brief, “Economic Security and Safe Relationships: Pathways and actions for partner violence prevention” explores how economic security is a protective factor against violence and how to foster economic supports as opportunities for prevention across the Spectrum of Prevention. There are a few ways that economic security prevents violence, and Prevention Institute’s brief provides an overview of these mechanisms. Family and community economic insecurity are risk factors for intimate partner violence, so the inverse–economic security–can support safe, healthy relationships and prevent violence. When basic needs are met, people and communities experience less stress, less housing insecurity, and less conflict and instability, reducing risks for violence. Economic security can also be a vehicle for promoting gender equity and prevent financial dependence on a partner, dependence which then can be exploited in cases of abuse and violence. Closing the wage gap and supporting gender equity addresses sexism and inequality as a root cause of violence. Economic security can also mean more resources for building social networks, contributing to community and social cohesion which are also protective against violence. 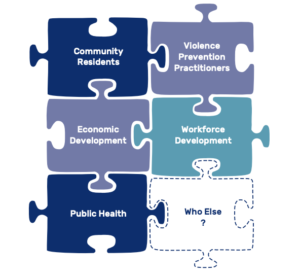 Violence prevention practitioners are not alone in their efforts to enhance economic security. Many other sectors, including employment, housing, and economic development can be new partners for violence prevention through this approach. Read the Prevention Institute brief here. Prevention Institute facilitated a recent PreventConnect web conference on a similar topic, Getting Started on Supporting Economic Opportunities for Sexual and Domestic Violence Prevention.